THAT'S A WRAP: Rep. Mark Cusack and Sens. 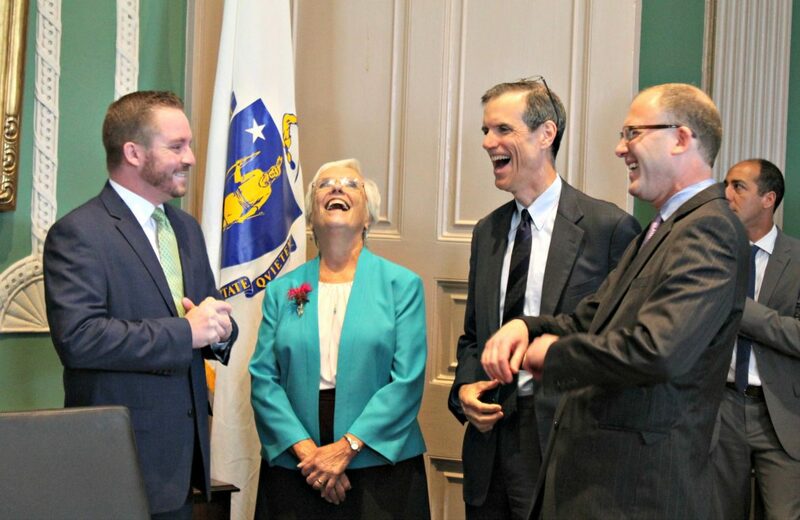 Pat Jehlen, Will Brownsberger, and Jason Lewis shared a laugh before the marijuana bill was signed into law Friday. With formal sessions wrapped up until after Labor Day, Senate President Stanley Rosenberg on Thursday afternoon told members they were free to leave and wished them "a very happy and healthy summer." from State House News Service and Sun research. BOSTON — Do not pass go, but do collect $200 million. That was the message from Democrats on Beacon Hill to Gov. Charlie Baker last week, marking what amounts to the most significant, if not the first, major policy dust-up between the Kumbaya Caucus of Three at the State House. House Speaker Robert DeLeo, D-Winthrop, and Senate President Stanley Rosenberg, D-Amherst, threw a brushback pitch when — in a mere matter of days after Baker signed the fiscal 2018 budget — they went along with Baker’s request for a swift public hearing on his proposed MassHealth eligibility reforms. But the court officers barely had time to lock the doors and shut the lights out in Gardner Auditorium when word trickled out that the Legislature would vote the next day to rebuff the governor and his call for Medicaid reforms to be packaged with new fees and fines on employers to pay for health insurance for the low-income and disabled. The Democratic leadership decided reform can wait, but the revenues cannot. And so both branches voted overwhelmingly, and for the second time, to send Baker new employer assessments, deemed taxes by many critics, to pay for MassHealth without the administration and business community’s desired cost-saving measures. “I’ll take a look at it when it gets to my desk and then we’ll make a decision and I’ll be sure to let you know when we make that decision,” Baker said Thursday after the dust had settled, knowing he has three choices. Baker can sign the assessments and risk alienating the business community; veto the bill and force lawmakers to override, for which they have the votes; or let the assessments become law in protest without his signature after 10 days. 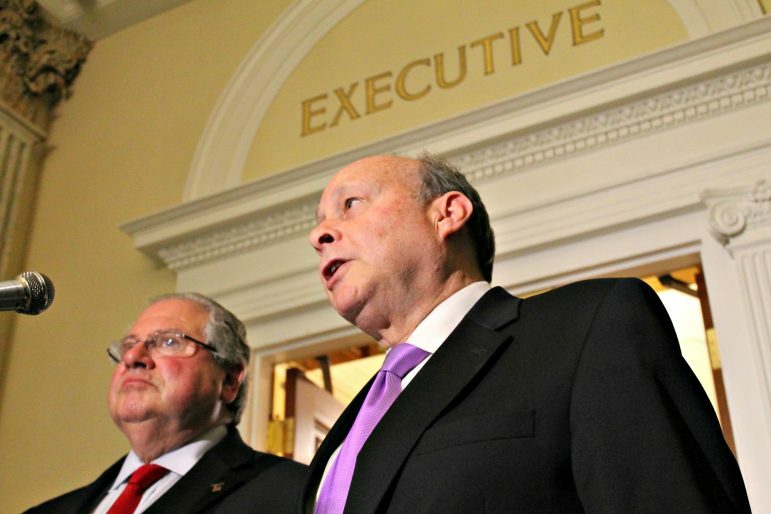 Option two would force DeLeo and Rosenberg to decided whether they must call members back from the August recess, which began Friday, to override or wait until after Labor Day in contradiction of their assertions last week that the assessments need to be implemented immediately if the state is to collect the money it is counting on for the fiscal 2018 budget. The polite game of chicken unfolded as U.S. Senate Republicans tried — and ultimately failed — to muster 50 votes to repeal and replace, repeal, or “skinny repeal” Obamacare. After overcoming the odds to proceed to a debate on health care, it seemed all week that Senate Majority Leader Mitch McConnell didn’t care what bill he could pass, as long as he could pass something. In the end, he couldn’t. Sen. John McCain, recently diagnosed with brain cancer, dramatically slammed the door on repeal-and-replace efforts when he joined two other Republicans in the wee hours Friday morning voting against a repeal measure intended to move the Senate into negotiations with the House. McCain said it was time for Republicans and Democrats to work together and listen to the country’s governors about how best to fix the healthcare system, which should be music to the ears of governors like Baker. “This is not the end of our healthcare debate,” Sanchez said as criticism was expressed over Baker’s plan to move 140,000 MassHealth enrollees on to subsidized commercial plans with higher out-of-pocket costs. The Gentlelady from Ashland took her own turn in the spotlight at Tuesday’s hearing when she was anything but gentle. Senate Ways and Means Chairperson Karen Spilka came ready to tango with with the administration’s trio of secretaries sent to defend and advocate for Baker’s plans to reform MassHealth. Spilka made clear she believed the administration did not have “a monopoly on the ideas that are out there on healthcare,” and asked panel after panel to submit their own recommendations for lawmakers to consider in the coming weeks and months. 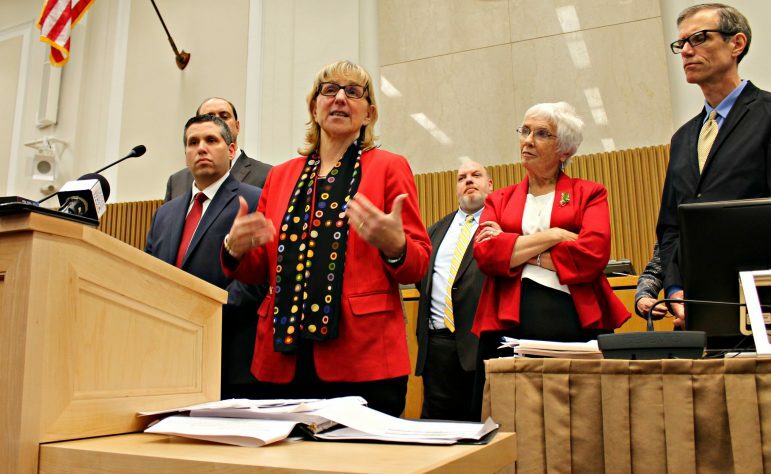 Sen. Karen Spilka had harsh words for the Baker administration’s healthcare reform stance. “This is an ongoing issue and there are other ways to go about savings, rather than necessarily moving people off of MassHealth,” Spilka said. Building consensus for healthcare changes in Massachusetts, as in Washington, may be a difficult task, but the governor and legislative leaders were on the same page last week when it came time to finalize marijuana oversight and protections for pregnant workers. Baker signed both bills upon his return from a political trip to Colorado, and in doing so helped cement the two biggest legislative achievements of the year outside of pay raises for public officials, which Baker opposed, and an annual state budget. With an annual budget and a legal marijuana law in place, Massachusetts lawmakers slipped away from Beacon Hill last week after a seven-month stretch during which they approved pay raises for themselves and looked on with concern as Washington gave serious consideration to rolling back health care laws that have strong support on Beacon Hill. House and Senate members drove off Beacon Hill without taking action on sales-tax-holiday legislation, their silent inaction likely dooming an effort that legislators in previous years have described as a deserved and needed boost for consumers and store owners. Retailers have been mulling a possible 2018 ballot question slashing the sales tax and must decide by this week whether to take the first step. Wednesday at 5 p.m. is the deadline for potential 2018 ballot question sponsors to tip their hands by filing language with Attorney General Maura Healey’s office. The House and Senate plan to continue meeting at least twice a week during the break from formal sessions, advancing bills as long as they have agreement from the few members who attend such sessions. Lawmakers are awaiting Gov. Baker’s decision on a healthcare take-it-or-leave-it proposal they put on his desk this week. The governor, whose bid for MassHealth reforms was denied in both branches, can sign or veto a bill with new employer healthcare assessments and unemployment insurance rate relief for employers. If he does not sign or veto within 10 days, the bill automatically becomes law. The nightmare is over, at least for now. Thank you to the American people for speaking out and fighting back, and thank you Senators McCain, Collins and Murkowski. A pair of Cape Cod lawmakers is urging legislative leadership to restore more than $4 million in funding for areas they say are priorities for the lesbian, gay, bisexual, transgender and questioning community. Sen. Julian Cyr of Truro and Rep. Sarah Peake of Provincetown wrote to Senate President Rosenberg, House Speaker DeLeo and Ways and Means Chairperson Sen. Karen Spilka and Rep. Jeffrey Sanchez, asking them to support overriding five of Gov. Baker’s budget vetoes. The letter references a veto of $2.5 million for HIV treatment and prevention; $675,000 for unaccompanied homeless youth services; $200,000 for school-based health programs; $300,000 for summer jobs programs; and $340,000 for matching grants for at-risk youths. “As ugly debates about the dignity of LGBTQ people, immigrants, people of color, and religious minorities continue to swirl at the national level, Massachusetts must send a clear message affirming our belief in the potential of marginalized communities,” Peake and Cyr wrote. Baker said in his veto message that he removed funding for earmarks that are “not recommended” in the line items for school-based health programs, youth at-risk grants and summer jobs. He wrote that he struck the full $675,000 in funding for unaccompanied homeless youth services “because it is too small to be effective at the enacted level of funding,” and lowered the HIV prevention funding to match what he recommended in his January budget proposal. Lawmakers want to drench the first week of August in cold water, as they sent Gov. Baker legislation Thursday to annually commemorate the catchy and frigid fundraising activity known as the Ice Bucket Challenge. A former Boston College baseball team captain who grew up in Beverly, Frates was diagnosed with ALS in 2012. 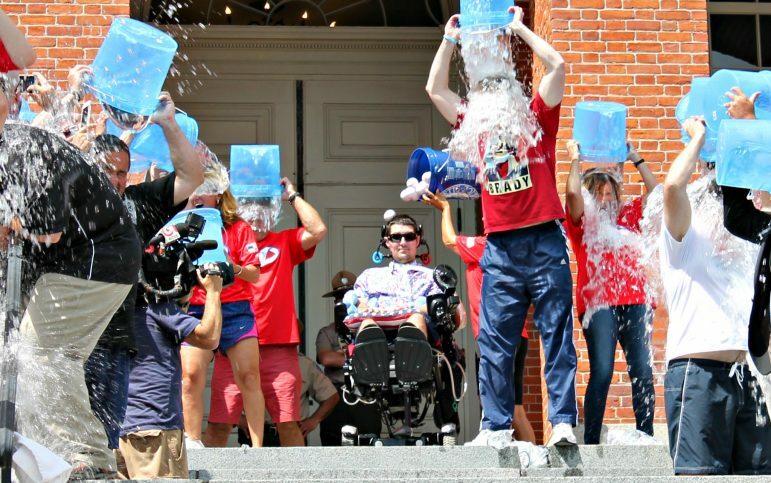 Pete Frates took part in an Ice Bucket Challenge on the front steps of the State House in 2015 with Gov. Charlie Baker and other state officials. The rolling fundraiser involves one person challenging another to donate to ALS research and also to have a bucket of icy water dumped on his or her head. The person challenged then becomes the challenger for someone else, as the ice buckets keep spilling and the fundraising dollars pour in. The family has reportedly struggled to keep up with the cost of care and is accepting donations at PeteFrates.com. One of the few questions concerning the bill’s future is whether the governor will incorporate a bucket brimming with icy water into a signing ceremony for the legislation. Baker is an avowed supporter of the challenge, leading a group of officials on the State House steps in 2015 to douse themselves in cold water in the name of the charity.